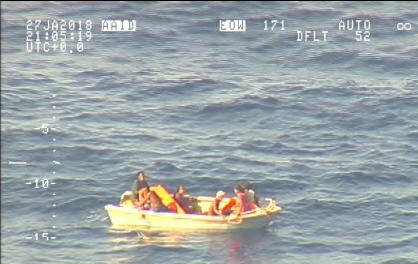 SYDNEY—Seven survivors from a ferry that went missing in the Pacific Ocean a week ago were found adrift in a dinghy by a search plane on Sunday, the New Zealand Defence Force (NZDF) said. The 17-metre (56 foot) ferry with 50 people on board was reported missing on Jan. 20 two days after it departed Nonouti Island on a 250 km (155 mile) trip to Betio in Kiribati. A Royal New Zealand Air Force P-3K2 Orion aircraft spotted the dinghy within two hours of reaching the search area on Sunday morning, the (NZDF) said in a statement. “The crew has dropped them aid supplies containing water, food and a radio and are currently trying to establish communication with them,” Air Commodore Darryn Webb said.A fishing vessel was on its way and was expected to reach the survivors later on Sunday, he said.”The Orion will continue to search the area, making every effort to locate any more survivors, while awaiting the rendezvous with the fishing vessel,” he said. The search continues for the missing ferry, a wooden catamaran which ran aground and underwent repairs to its propeller shaft before it left Nonouti Island.